You’re a professional mechanic, an enthusiast or and mechanic shop owner? 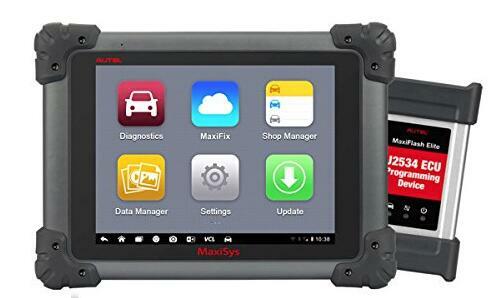 Then you are here on the right page with the in-depth review about Autel MaxiSys Pro MS908P Car Diagnostic Tool, which is only for mechanics. The Autel MaxiSys Pro MS908P Professional OBD2 scanner provides best solutions for ECU programming and Specialized Automotive Diagnosing. Autel MaxiSys Pro MS908P is easy to use with a large pool of features that ensure optimum diagnosis performance. Autel MS908P runs on Android OS thus enables you to multitask and manage many applications at the same time. By this, you are able to fix a particular part of the engine and at the same time monitor the effects it has on other parts. The diagnostic scan tool has a wide vehicle coverage, from 1996 onward. It can work efficiently with over 80 vehicle makes in the US, Europe, and Asia. MaxiSys pro Software, as well as a reprogramming box, is incorporated into the tool to make it possible to solve complicated problems. It runs on an Android 4.0 OS and has a strong Cortex-A9 Samsung Exynos 1.4 GHz processor which enhances its speed a great deal and allows multitasking. When powering it on, it takes 20 seconds to boot up, a speed that is approximately 5 times quicker than similar products on the market. This is a new technology for quick and precise identification of vehicles that are CAN-enabled with just a single touch. Data is displayed in texts as well as graphs which makes analysis easy and efficient. Its 11000mAH-3.7V battery lasts up to eight hours with continuous operation and it’s only a few of hours of recharging. The 9.7 inches IPS touch-screen is LED-back-lit and has 1024 by 768 resolution thus providing a clear contents display. Multi-touch is also an added advantage with a possibility of 5 touches at a go. The Car Scanner Autel MaxiSys Pro MS908P has 2 GB DDR-3 RAM, which comfortably handles large numbers of files and supports live streaming without hanging. The 32 GB internal hard drives provide enough space for storing all the clients’ detailed history. The 5-megapixel inbuilt rear camera provides images of high quality with its auto-focusing capability. This Autel Diagnostic covers almost all OE-Level Diagnostics. This means that OE_level library in the device contains all error codes that are likely to occur. Its dimensions are 9 by 18 by 7.6 inches in length, width, and height respectively.